4 Bedroom, 5 Bath Penthouse- The Finest View In Cabo. Welcome to the most luxurious penthouse in Cabo San Lucas. Vista del Rey is the most private residence at the new exclusive Hacienda Beach Club located on El Medano beach in downtown Cabo San Lucas. This truly beautiful retreat is the only penthouse on the 6th floor; there are no neighbors on either side. The exquisite views, sunsets and sunrises will inspire you. Once inside Vista del Rey, you will enjoy 4,000 square feet of luxurious furnishings including four ocean front bedrooms. Relax in the additional 1,200 square feet of private terraces. 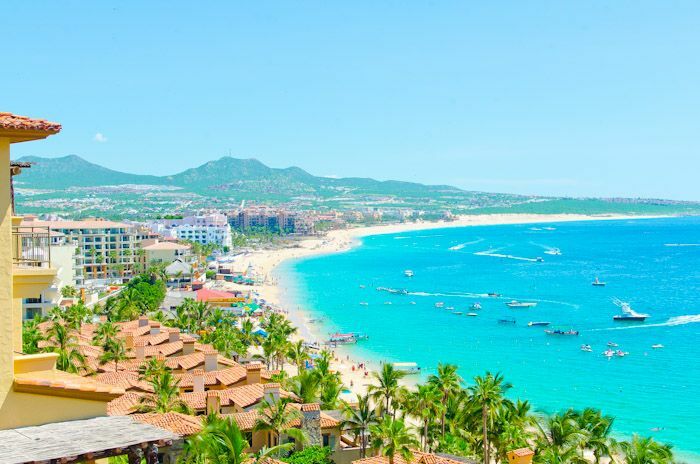 Enjoy the stunning 360 degree view of the beach, marina and all of Cabo San Lucas. We chose our Hacienda penthouse to replace our condo in Maui that we had owned for about 30 years. We always thought we had the best condo in the world there! NOW we think we have the best penthouse anywhere! The nicest and most private penthouse condo in Cabo- come see for yourself. From the front terrace, you have a 250 degree view of the Medono beach, a picture view of the Pacific and an ongoing parade of fishing boats from the Marina -all from a 6 story vista- 'it doesn't get no better than this'. The King's View Penthouse at the Hacienda was absolutely perfect. The size of the rooms were wonderful, and the division of space is well thought out. The veranda outside overlooks the ocean and the attractions on the beach in a magical way. This is a perfect location for both quiet adventure seekers, and those who want to be walking distance from all attractions in the area. I look forward to staying here again, and thank Clint and his team for a very lovely experience. This 4 bedroom condo was beautiful. The view from every room was breath taking. It is a great location to walk to wonderful restaurants and the pool area is great. Beautiful piece of paradise! Not a bad thing to say. One of the best vacations I have been on! Glad your group had a wonderful vacation and we look forward to seeing you back again soon. There is no place on earth like it!! Every part of staying at the King’s View is like a dream. The view from the balcony is simply breath taking, both sea side and city side. Every day the sky is a different painting and the city lights are always a nice complement to a night cap. The apartment is the closest building to the gym, restaurant, pool, and beach access gate. Not to mention only a ten minute walk to the marina! The apartment is set up for cooking-in if desired and Cabo is always great for going out and enjoying the town and people. The staff is friendly and accommodating. Very responsive should you need help. Easily one of my favorite places to go and be. Thanks for that great review and its always nice to hear that our guests had a wonderful stay in The Kings View. Ill be sure to share your review with others and our staff. We look forward to seeing you back again one day soon to the Kings View at The Hacienda. I can't say enough about the quality of our visit. The staff is with out a doubt the friendliest, most helpful and just fun to be around. The food is wonderful at the Cabana. They prepared the Mahi Mahi we caught for our group and served us so well. If you EVER want to be treated like family and relax at the same time this is a MUST for you. You'll make wonderful new friends and have the time of your life. Close to the beach, shopping, dining, and Marina. I'd give them more stars if I could! Thanks for that lovely review and it was nice that you and your family enjoyed celebrating your 30th anniversary in Cabo. Sounds like you had a fantastic time and you certainly stayed at the finest Penthouse on the beach which helps add to the experience , we hope to see you and your family back again one day soon to the Kings View Penthouse. The over all property was over the top! We couldn't have stayed at a nicer place. You walk in the door and just stand there, speechless. Over the top! 4 bed rooms AND 4 1/2 bathrooms ! You can't beat the view, the sunrise was worth getting up for everyday we were there. My favorite exercise was paddle boarding! That was so much fun!! When we didn't go down stairs for the amazing food, we cooked in house and everything we needed to make as meal was right there. thanks for writing the review and glad you had a wonderful experience in The Kings View Penthouse and we hope to see you and your family back again one day soon. Hacienda Beach Club & Residences fronts a quarter mile expanse of the most swimmable beach in Los Cabos, Medano Beach. Perfect the art of lounging under a palapa. Build a sand castle. Take a dip in the inviting 80° water. Or if you need a change of pace, wander down Medano beach and take a water taxi to Land's End for a little snorkeling. Hacienda's Beach Activities Pavilion will allow residents to take full advantage of the adjacent waterfront. An impressive array of equipment will be available including: Kayaks, Snorkel gear, Paddleboards, Horseshoes, Volleyball and Footballs. Stretching two miles, Medano Beach is a great place to hang out, with plenty to explore. Starting right outside at the Hacienda Beach Resort you can find a more relaxing beach experience away from the crowds. As the beach extends around Bahia San Lucas all the way to the resorts of Club Cascadas and Villa del Palmar you will find all the goodies most people come to expect from a prime tourist destination. Whether you choose an activity such as swimming, jet skiing, kayaking, paddle boarding, waterskiing, banana boating, parasailing, volleyball, or just want to hang out and enjoy the beach parties, you’re sure to have a good time here. Popular spots to eat and grab a cool one are The Office, Mango Deck, Billygan’s Island, and Las Palmas. With plenty to do and little surf year round, this beach is highly recommended for families.